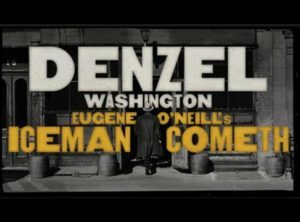 May 5, 2018: Two massive works by dramatic theatrical giants Eugene O’Neill and George Bernard Shaw are making rare appearances on musical-heavy Broadway. The fact that masterworks The Iceman Cometh in a commercial, limited run and Saint Joan from Manhattan Theater Club as part of its subscription season at the Friedman, are being presented at all in the same lowbrow venue with Disney and Donna Summer musicals should be cause for celebration. But their current incarnations fall short of their full, devastating potential. The respective directors and casts fall into the easy trap of audience-pleasing laughs—and yes, they are there even in somber, dark-hued O’Neill—and they miss the mark as complex portraits of man’s conflict with the illusions and institutions he has created. Iceman is O’Neill’s most challenging, unforgiving epic. Debuting on Broadway in 1946, this marathon of regret and pain was considered a failure until Jose Quintero directed a definitive production in 1956 at the new Off-Broadway Circle In the Square. Jason Robards’ iconic performance as the glad-handing but self-loathing salesman Hickey established him as his generation’s prime interpreter of O’Neill. The setting is ironically names Harry Hope’s downtown dive in 1912 Manhattan where the drunken denizens deceive themselves with dreams of achieving their past glories—tomorrow. The normally jocular Hickey arrives for his annual binge but offers unforgiving truth rather than comforting pipe dreams. Stars such as James Earl Jones, Kevin Spacey, Nathan Lane, and Lee Marvin (in the leaden 1973 film version) have attempted to put their mark on Hickey, but none have approached Robards whose masterful liming survives in a 1960 TV version and which he recreated in a 1986 revival. Denzel Washington makes a game effort to conquer this combination jester and devil, and he nails some of the character’s dimensions. From his first entrance charging up the theater’s aisle and through much of the show’s nearly four-hour running time, he captures Hickey’s intense jocularity. Unfortunately, he misses the darkness beneath the sunny exterior. Robards managed to simultaneously convey the drummer’s boisterousness and his inner disgust. 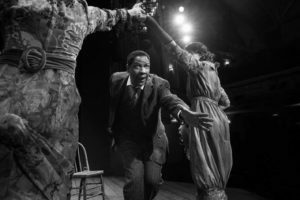 Washington doesn’t latch onto that anger and hatred of self just as he missed those qualities in the protagonists of Fences and A Raisin in the Sun. 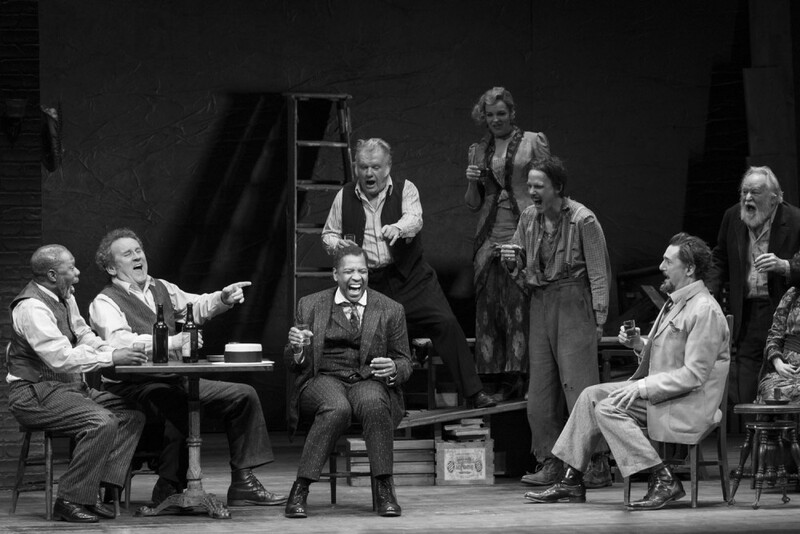 Similarly, his director the versatile and usually incisive George C. Wolfe (Angels in America, Lucky Guy, Shuffle Along) emphasizes the humor of Hickey and the huge cast of pitiable drunks clinging to their fantasies. As a result, the audience gets a hearty chuckle at their foibles and no gasps of recognition that they share the same condition. Wolfe seems to be saying to us, “Let’s have a laugh at these kooky old alcoholics from 100 years ago,” while O’Neill was saying “These kooky drunks are you people. They are all of us. We all need our illusions or we die.” Wolfe further shatters O’Neill’s horrifying construct by having Washington play his climactic confessional monologue seated center stage straight to the audience, removing any doubt that this is a star vehicle for Washington rather than a shattering indictment of all humanity. There are moments of mirth and some depth supplied by Reg Rogers, Neal Huff, Bill Irwin, Michael Potts, Danny Mastrogiorgio, and Tammy Blanchard as various delusional dreamers, but this Iceman is a mild summer cooler rather than a stiff belt that freezes your insides. Just as Hickey is an Everest of role for males, Shaw’s Saint Joan is an irresistible summit for actresses such as Sybil Thorndike, Katharine Cornell, Wendy Hiller, Siobhan McKenna, Diana Sands, Lynn Redgrave, and Maryann Plunkett. 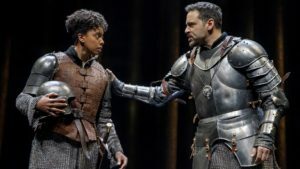 Condola Rashad is more successful in probing the depths of the fiery maiden than Washington is of getting to the heart of Hickey, but she still doesn’t deliver Shaw’s complete package in Daniel Sullivan’s tepid production. 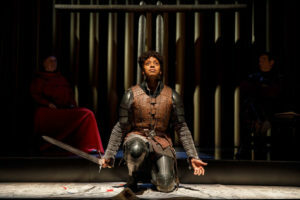 The play opens with Joan boldly entering the castle of a powerful lord, claiming she hears voices from heaven telling her to lead the 15th century French army against the occupying British. Shaw casts her as a voice of reason and a symbol of the coming modern age of Protestantism and nationalism threatening the omnipotence of the Catholic Church and the wealthy secular barons. In the early scenes, Rashad plays her as a mad mystic with a wild look in her eye rather than a practical young woman speaking truth to power. 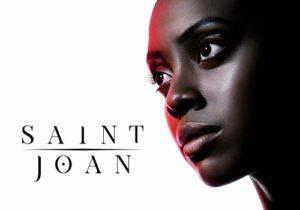 As the play advances and Joan moves from soldier to martyr to saint, Rashad grows in power and conviction, but she never convinces as Shaw’s plain-spoken woman of the people or as a charismatic leader. Another similarity to the new Iceman is this Joan’s simplistic, hollow staging. Sullivan is content with showy theatrics when mounting Shaw’s witty and dense debates between figures of royalty, church, and military. A vital scene between the Bishop of Beauvais and the Earl of Warwick which conveys Shaw’s central theme of the warring factions of church and state, falls flat due to the surface-y liming of Walter Bobbie and Jack Davenport. It’s more of a shouting match than a clash of ideas. There is a modicum of surprise and snap in the epilogue when Joan and all the figures of the play appear in a dream to explain her impact on modern society. 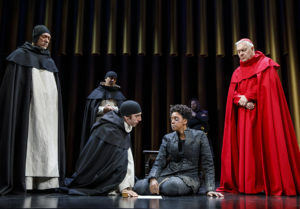 Patrick Page displays a glimpse of the deeper forces at work by underplaying The Inquisitor, Joan’s chief judge at her trial for heresy. Robert Stanton in three contrasting roles and John Glover as a pompous archbishop also supply satisfying work but it’s not enough to light Shaw or Joan’s fire.